Freddy and Danny Naghizdeh will have gone home delighted at the turn out and performances at their debut show of Mixed Martial Arts (MMA) at the Isis Arena in Nottingham. In all, 13 fights and one exhibition were staged and I don’t believe anyone left feeling dissatisfied. The night of what is sometimes referred to as Shoot Fighting, Vale Tudo, Cage Fighting, Ultimate Fighting or indeed MMA was a good start and sign of things to come for the almost identical Naghizdeh brothers. 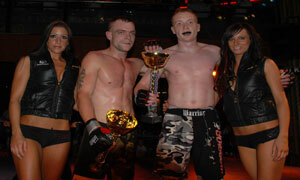 The show closer featured another Scouse fighter from the Wolfslair club in Paul Kelly. At just 22, Kelly looks to have a bright future as he took exactly two minutes to apply a side choke and leave Soli Klitschko from Lithuania tapping out. Kelly, now undefeated in five starts was as they say in Liverpool ‘made up’. Both fighters scaled 77 kg. Quickest winner of the night was Liverpool based Brazilian Henrique Cesar Nogueira Bahia aka ‘Chaco’. On the other side of the cage was Svajunas Siaucila from Lithuania. The 34 year Chaco made a spectacular start flying at Siaucila and flooring him by the wire. He then pounded the face with almost blinding speed and the Lithuanian was in trouble. Referee Mo Coles stopped the pro contest with just 63 seconds to register the Wolfslair fighter’s tenth win in 15 starts. Both fighters weighed 84 kg. In the semi-pro ranks, popular Nottingham fighter Andiano Marciano 76.5kg took on Wolfslair fighter Mick Bowman 77kg. Bowman flew out of the stalls and cracked in a right that floored Andiano and when he rose, Bowman applied constant pressure. That said, Andiano showed signs of a comeback when he started to get into things before Bowman once again launched his assault. Unsurprisingly, Andiano’s corner retired their man after two rounds of action that saw Bowman build a sizable lead. A rear naked choke applied by Craig Robertson of Dundee in Scotland and a member of the Shooters MMA club was enough to force the capitulation of Wolfslair’s Paul McBride. The match at pro level and scheduled for three five minute rounds ended at the 4.23 mark of the opening stanza. 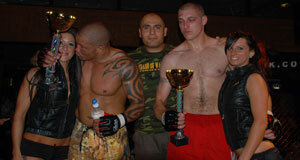 Both men were making the pro debuts but Robertson (85kg) was a worthy winner. The only thing Wolflair’s McBride (84kg) lacks is experience. They may have looked overweight and out of shape but Nottingham based Pole David Cepliski was too lively for fellow Nottingham fighter Gil Surepi (109kg). Gil originally from Copenhagen in Denmark and fighting out of the Raw Physique Gym capitulated from a side choke after just 79 seconds. It was Surepi’s debut and Cepliski’s (115kg) first win in three starts. In the semi-pro ranks, Karsten Lenjoint fighting out of the Master Lek Gym in Nottingham took one minute and 47 seconds to dispose of Perth’s Hamish Herbert. The three five minute rounds was aborted when Herbert (68kg) tapped out due to a swiftly applied Guillotine choke from Lenjoi (67kg). Both men were making their debuts in the semi-pro ranks. Amongst the semi and professional ranks, was a smattering of amateur contests. Confusing and unsatisfactory is one way of describing these matched to an uneducated public. With no fist strikes to the head from either a standing position or on the canvas, it seems a stuttering of raw novices. Of course it is more than that but to the naked eye it is difficult to justify what can be an unfulfilling experience. The first of the amateurs to go over two five minute rounds was Liverpool’s Kris Morris who overcame Blackburn’s Danny Livesey with 45 seconds left on the clock. Morris from Wolfslair and Livesey from Bisping Total Fighting both scaled 70kg and in truth there was never much between them. However, this sport can switch in the blink of an eye and that blink came at the four minute 15 second mark due to what was described as a ‘choke’. Both men scaled 70kg. There was a little less success for fellow Clitheroe fighter Oliver McClean (84kg) who was beaten in three minutes of the final round by Nottingham’s Shaun Charles (83kg). Shaun from the Tap or Snap Gym racked up his second amateur win in three starts with a triangle choke but there was a lot to like about McClean, known as ‘The Guvnor’. It was always hard fought and well contested up to the endgame and only McClean’s second fight. The night kicked off with three Thai boxing matches and one exhibition of K1 fighting. First up was Wythenshawe lightweight Anthony Collins (61.5kg) who despatched Manchester’s Pete Menga (62kg) by KO in one minute and 58 seconds of a scheduled three twos. Collins from Frank’s Gym had Menga’s measure early on and never let him into the fight until the ending came. Menga from Beastmasters has only picked up one win in five starts. While for Collins it was his second success in five outings. Nottingham’s Mark Barlow (83.5kg) fighting out of the Cobra Gym took 87 seconds to beat Manchester’s Nick Alfieri (80kg). It was Nick’s second defeat in five fights and for Barlow his second win in as many starts. Mohammad Jafa Rahmati (74kg) was too lively for Andy Crichton (68kg) from Nottingham over three two minute rounds. Rahmati was considerably heavier at 6kg more and that would have made all the difference despite the fact that Rahmati was making his debut and this was fight number six for Crichton. 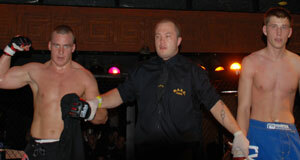 The fight was won by Andy Crichton due to referees decision. Next up was the baby faced Karl Fowler (65kg) from Clitheroe and Bisping Total Fighting who faced a man who may have been twice his age in Johnny Lee (65.9kg) from the Tap or Snap Gym in Nottingham. The two five minute rounds of action were true give and take and it was little surprise to see the judges unable to separate them after ten minutes and the result was a draw. This would make a good return. Marios Konstandi (103kg) originally from Cyprus was left without an opponent when his original foe simply didn’t turn up. Steve Primrose (no weight given) from the Pele Gym in Manchester filled the breach at very late notice and the two boxed an exhibition. Konstandi unbeaten after one fight had lumps of weight over the first timer but they kept things interesting over three two minute rounds.